When we were expecting our oldest (Curly, now age 9), I read all the parenting books and blogs. I knew exactly what you were *supposed* to do. I was slightly horrified that my husband seemed content to just “wing it” when it came to bringing our baby home from the hospital. My labor and deliver did not go at all like anyone anticipated. I had severe complications and was taken to the ER. After lots of tests and labwork, the doctors made a scary diagnosis and little Curly girl was born that very day – a full month early. I spent the entire hospital stay on anti-seizure medications and was extremely sick. I slept through every visitor who came to see our sweet new baby. I was too sick to sit up and hold Curly and too tired to think about parenting. My sweet husband stepped right in and changed every single diaper, rocked her to sleep, and held her while she fussed. He became super dad overnight while I miserably wished I was able to be the mother I had dreamed of being. After we were released from the hospital my husband jumped right into the daily tasks of taking care of our newborn while also taking care of me. He seemed to have no fear of this tiny 5 pound infant. He soothed and rocked her with confidence as I watched in worried silence. After all, he wasn’t doing things quite how the parenting books recommended. However, I saw that my newborn was happy and content and my husband had bonded deeply with her. That’s when I realized: Daddies do it differently but that in no way makes it wrong. To this day, he and Curly have a strong bond and she has always been a Daddy’s girl. I’m so thankful that I encouraged my husband to be involved without criticizing his efforts. He didn’t read all the parenting books but he was unafraid to love, care, and be involved. Daily I’m reminded that my husband handles things differently. While I usually applaud his efforts, sometimes I have to stop and laugh. Case in point: A few months ago I had an evening out with some other homeschool moms. We talked for hours about our homeschools and our children. We left our time together feeling encouraged and uplifted. As I walked into my house I noticed that there were multiple buckets on the floor in the downstairs bathroom. Every towel in the house lined the floor of the bathroom and the hall. I was almost too afraid to ask what had happened. Apparently my husband had bathed all the children. He put Bee and Ladybug in one tub together while putting all the other kids in different tubs throughout the house. Even though he was nearby and checking on the girls often, he neglected to turn off the water in their tub. He assumed that they would turn off the tub when the water was high enough. (He sometimes forgets how little toddler type people think- or don’t think…). The upstairs tub had overflowed and flooded the upstairs bathroom which in turn leaked down into the bathroom where Curly was bathing, prompting her to start shrieking that it was raining inside. He then had to run into the bathrooms to see what was happening. All this time he was carrying Punkin who was wrapped in her little hooded towel. As my husband recounted the story and expressed his frustration that the girls would not have thought to turn off their water I simply smiled. He was learning something that I saw every day as I homeschooled-kids rarely do what you expect. I reminded him that little children rarely think logically and things that are obvious to us are almost never obvious to him. He sighed and continued his clean up efforts while I tucked the kids into bed. I never said a word about the state of the house or the bathrooms or the fact that we had a small rainstorm in our house. 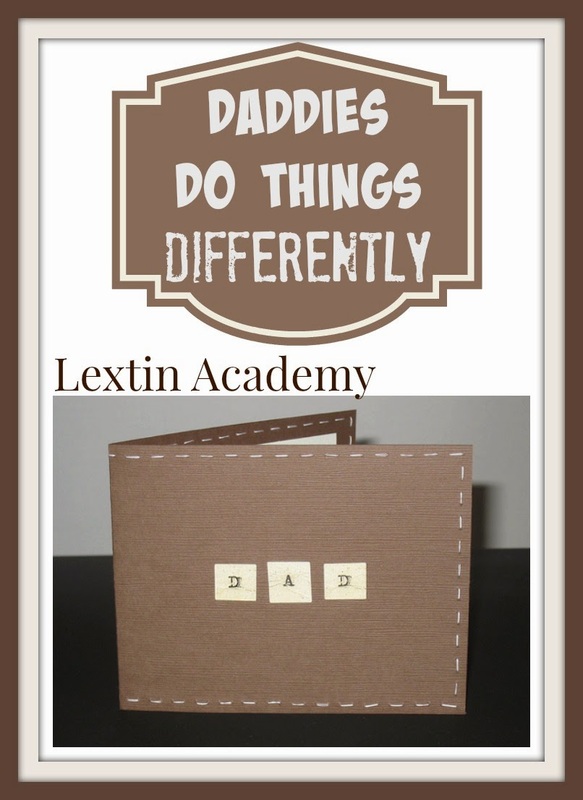 Daddies do it differently. I’ll keep any comments and criticism to myself and let him learn in his own way. I will sneak to the bedroom and laugh to myself though. Maybe he should have read those parenting books after all…..